St. Francis was born at Paula in Calabria; after living as a hermit for five years (from the age of fourteen to nineteen) he gathered around him some companions with whom he led the religious life. This was the origin of a new order, to which he gave the name of Minims, that is “the least” in the house of God. Pope Sixtus IV sent him to France to help Louis XI on his deathbed. He remained there and founded a house of his Minims at Tours. 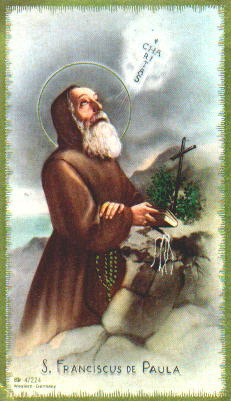 This entry was posted in Saints and tagged Catholic Saints, St. Francis of Paola. Bookmark the permalink.